On 26 October 1802 a royal baby was born in the noble house of Braganza. His birth took place in Lisbon, Portugal. The royal boy received the long name: Miguel Maria do Patrocinio de Bragança e Bourbon. Dom Miguel was the third son of King John VI of Portugal and his wife Carlota Joaquina of Spain, although some gossips from that time claimed that Miguel could be the result of an affair of his mother. But the boy always was considered as a son of the King. Miguel would become the Queen's favourite child. Anyway the prince would have at least 8 siblings. he returned in 1821 with his father and his mother. His brother, Pedro stayed in Brazil to act as regent. overthrow the parliamentary system and they dismiss the Cortes. On 30 April 1824, Miguel overthrew his father and he placed him in custody, where Miguel could 'defend' the King's life. Later Miguel went to Vienna where he was a guest of his idol, Metternich. There he learned that on 10 March 1826, his father had died and that his brother had taken the rule as Pedro IV of Portugal. Pedro IV of Portugal abdicated to the throne of Portugal in favour of his daughter, Maria II. The Emperor of Brazil instituted that there must be a regent. He offered the post to his sister Isabel Maria. However Isabel Maria became ill, so Pedro had to entrust the Kingdom to his brother Miguel. A decree was granted on 3 July 1827. The prince returned to Portugal on 22 February 1828. In Lisbon he was greeted with lots of ships and cannon fire. All were happy that Miguel was back. On 1 March 1828, dozens of citizens of Lisbon gathered at the royal palace and they claimed Miguel as their absolute King. 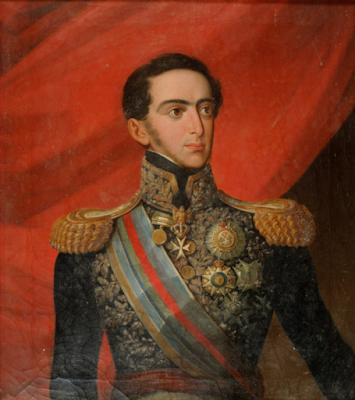 In 1831, other countries such as Spain and the Holy See started to recognise Miguel as the rightful King of Portugal. But his brother Pedro didn't agree. He came back from Brazil with an army to fight against Miguel. After a war that lasted at least three years, Miguel was forced to abdicate. This took place on 26 May 1834. In December 1834 the Cortes banned Miguel and his descendants from Portugal. Miguel lived the rest of his life in exile. On 14 November 1866 he died at the age of 64 in Esselbach then a part of the Kingdom of Württemberg.